Chilliwack – The 2nd Annual Fraser Valley Marches for Women is part of a global movement for women’s and human rights. Inspiring, uniting and leading the charge for the advancement of women across Canada. In partnership with the University of the Fraser Valley, Wilma House and the Fraser Valley Labour Council. People will gather on Saturday January 19 (11 AM) at the Ann Davis office on Young Road. There will be sign-making supplies available from 11:00 to 11:30, or you can bring a sign from home. Marching will begin at 11:30 from Ann Davis to Chilliwack City Hall, and the speeches will begin at City Hall at noon. If you are unable to walk, feel free to meet up at City Hall to hear the speakers. The march will occur rain or shine, so dress for the weather. 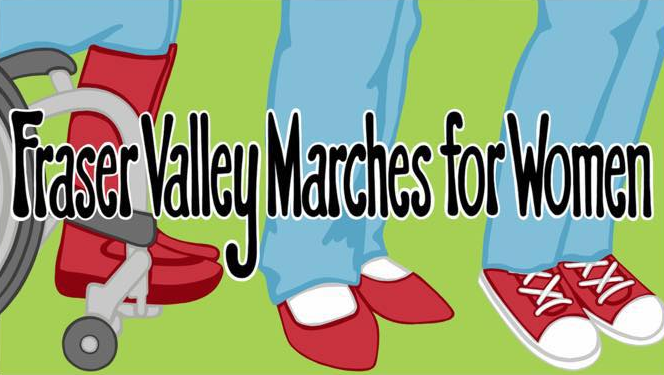 Be the first to comment on "2nd Annual Fraser Valley Marches For Women – Saturday January 19"